TM198 is melted down from a solid resin (in the supply unit) and applied using a heated hose and gun. It provides a organic, pliable thermoplastic barrier coating, which will protect all types of metal components against galvanic pitting and atmospheric corrosion as well as protecting from water and dust ingress. 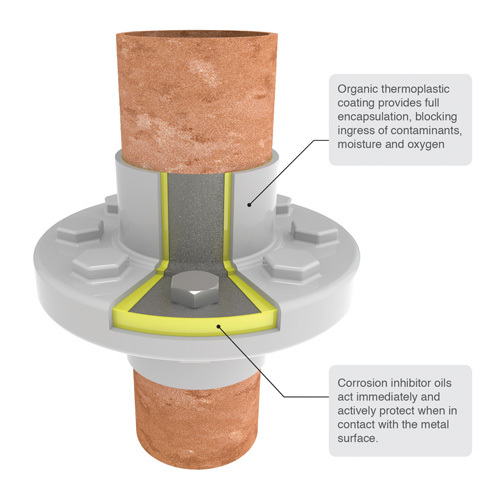 A key feature of the TM198 encapsulation system is the non-adherence to the substrate, along with the self lubricating properties, which allows any components that need to move to do so. The material can easily be cut and removed for access and maintenance, the area of removed material can then be refilled as the newly applied material will bond to the existing TM198. Alternatively the protected substrate can be inspected via UT directly through the material. There is no downtime during application and protection is provided immediately, bringing savings to both CapEx and OpEx. TM198 is proven to extend the lifecyle of components and reduce maintenance costs. It is excellent for a range of applications including; flanges, valves, bearings, piping, pipe supports, steel to concrete interfaces, bolts, electrical conductor isolation and long term storage of equipment in normal atmospheric conditions. 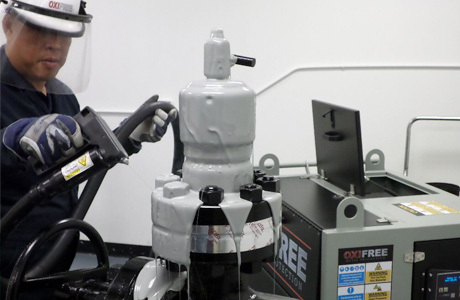 Our application machines have undergone extensive development and testing and come in 2 different sizes: 12lbs/5.5kg and 50lbs/22kg to cater for a total range of application criteria. The larger machine is also available IECEx certified.